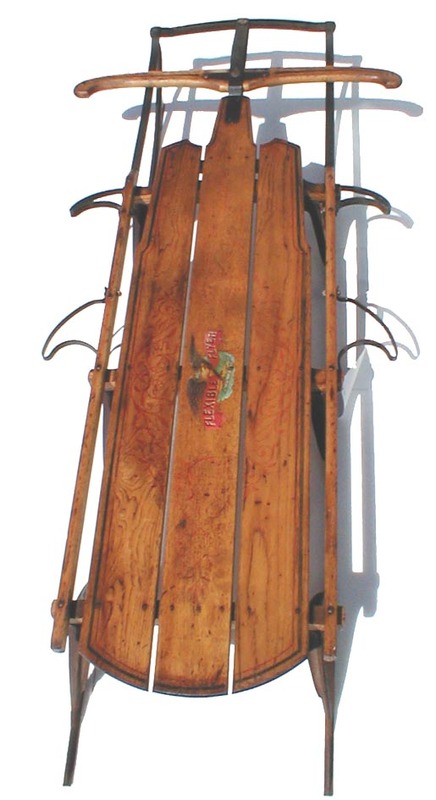 The sleds listed on this Slope (page) are Flexible Flyers. 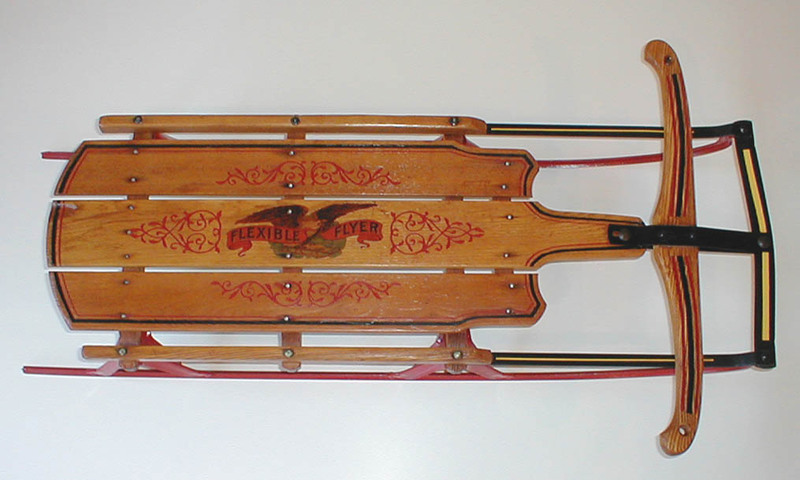 All older Flexible Flyer sleds were made by the S L Allen Company, originally in Philadelphia; they are designated as FF. The numbers indicate the size of the sled, with the higher number being longer. 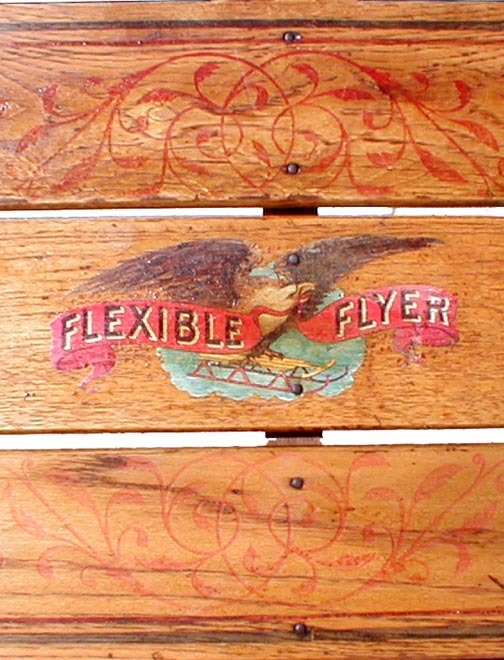 The Flexible Flyer sleds first were only numbered and then letters were added after the number, and then names were developed. We have been attempting to collect representations of these various categories which span from the early 1900's until the latter part of the 20th Century. The sleds on this page are all straight runner models and are arranged first in order of age of production, and then by model length for each production model. Please review our new page on Flexible Flyer dating (linked above) for more information on our estimate of the dating of the sleds. To increase loading time, Airline models have been moved to Jon's Slop P 2, Racer sleds are on a separate Racer page, and sleds by other manufacturers are on Jon's Slope P 3. FLYER SLEIGH No. 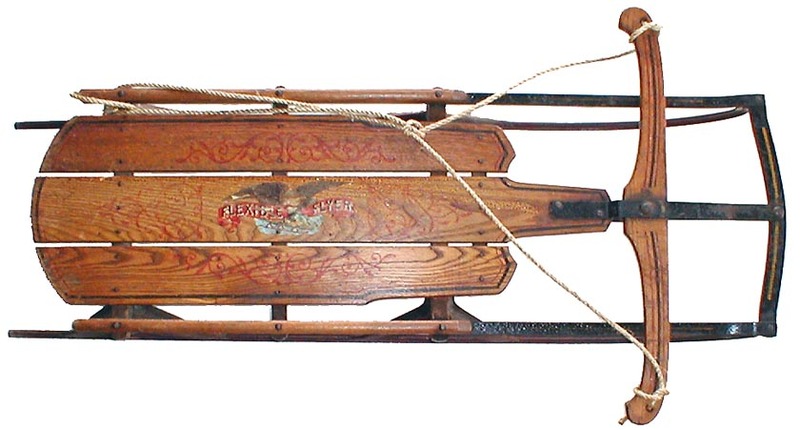 12 We think we are fortunate to have acquired this very early sled made by S L Allen. It is not steerable and dates from the very early 1890's. Painted red, we can see the diagonal outlines of the center graphics. Joan Palicia's book, p 16, shows an early brochure that enables the identification of the sled. We expect to restore it by carefully removing the paint in the hope that the graphics below can be identified. If anyone has experience doing that, we would appreciate your thoughts. 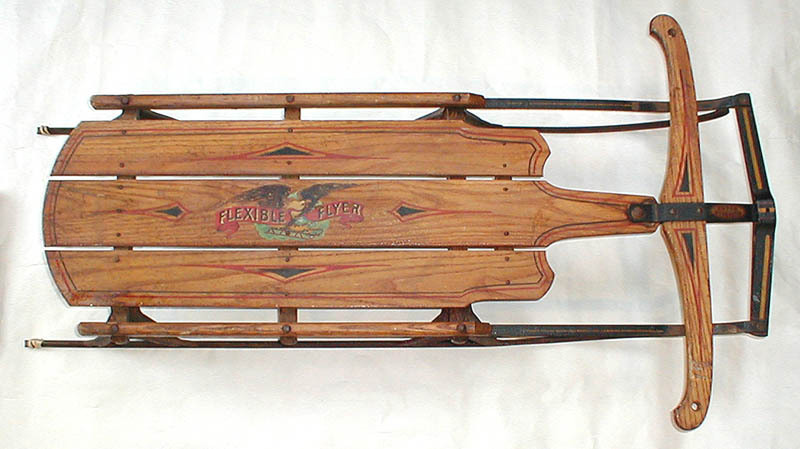 FF - No 5 This is one of the first steerable sleds by Flexible Flyer, made before 1900. Note that the center logo is a flower picture that was replaced by the familiar eagle around 1900. 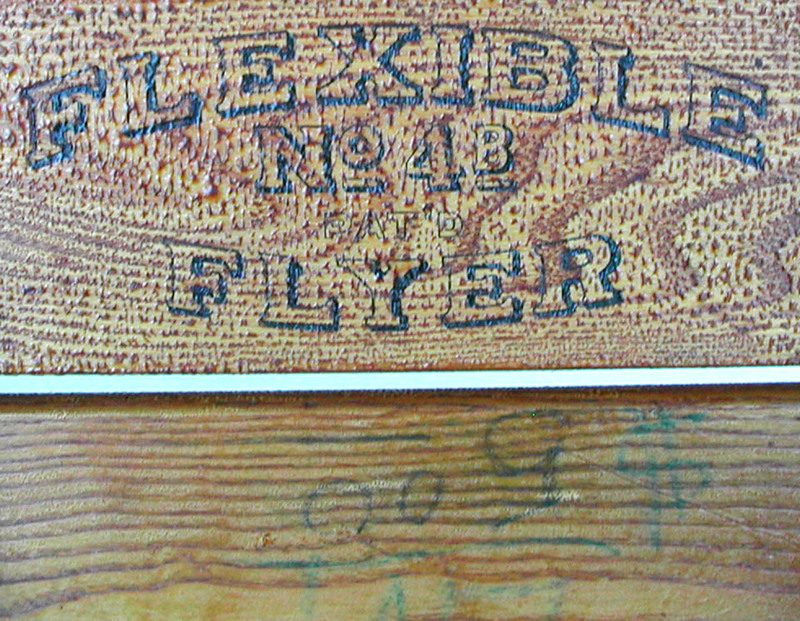 The bottom carries the label "Flexible Flyer No 5" over the word "Patented." Of further note is the absence of the goose neck at the front of the runner where it attaches to the bumper. The side rails are wood to the front bumper, which is also wood. 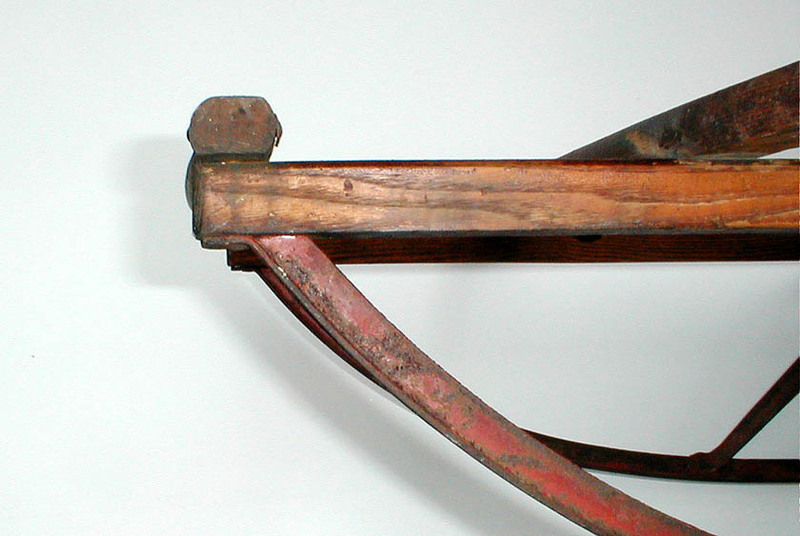 The bolts through the steering are with nuts rather than with cotter pins, although the footrests are identical to those seen on sleds many decades later. The remaining attachments are rivets with additional rivets through the bumper at the ends to prevent splitting. 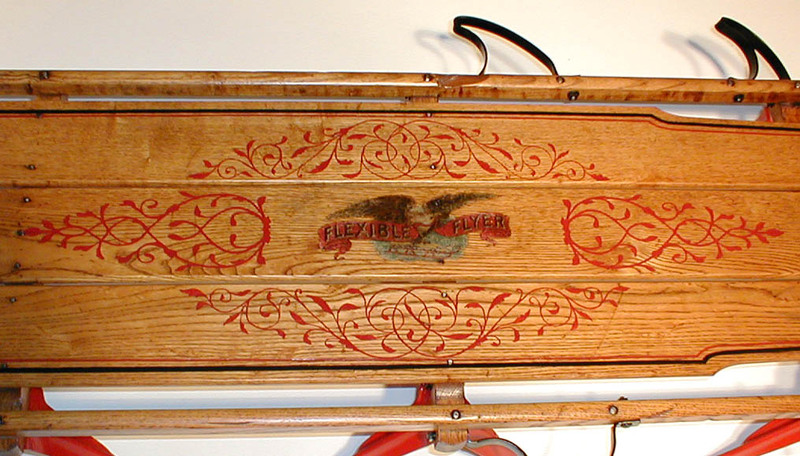 FF - No 2 This early sled from before 1907 has been refinished with the logo replaced. The runners are not grooved and the green stripe is said to be from the earliest of its kind. 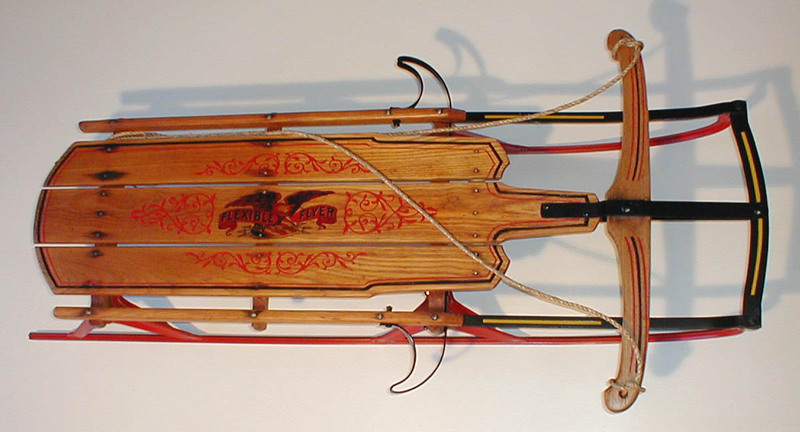 It is the subject of an article on refinishing old sleds on our General Information page. 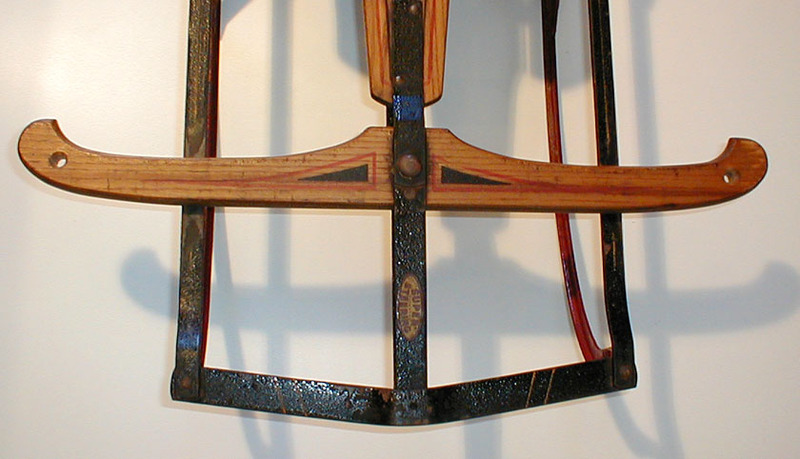 The structure of the sled is original with only a slight chip missing from the center cross piece. 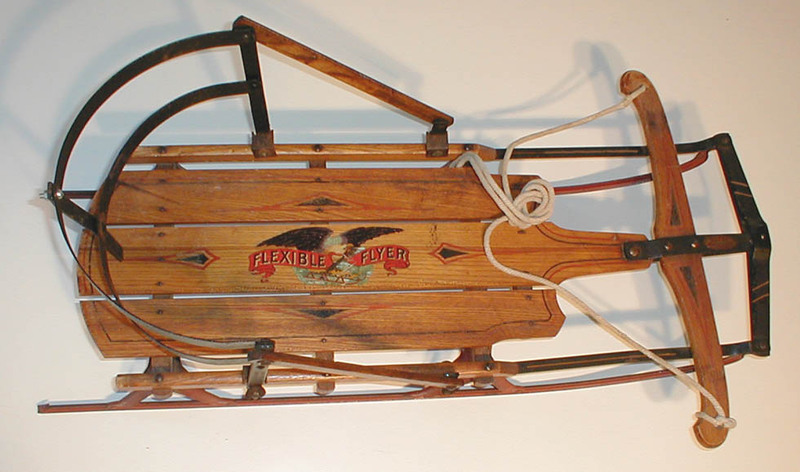 This sled has the goose neck design used on all subsequent Flexible Flyers, but not on the economy versions such as the FireFly sleds. 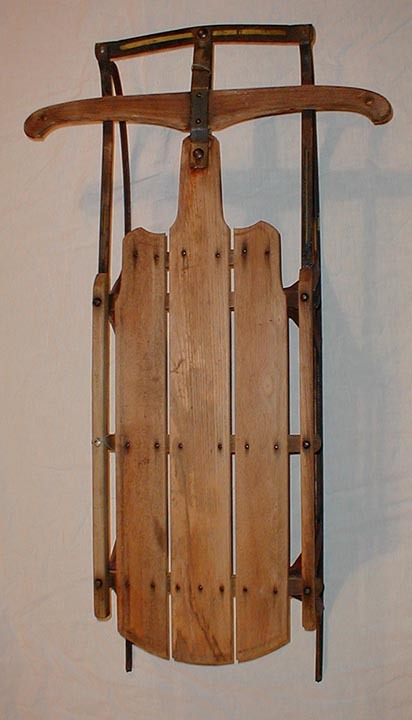 FF - 2 B The B series is believed to be the start of the sled with grooved runners. The sled at right had no markings and no finish at all. We restored it using a 2B from another collector as a model. The right side rail was broken at the center cross piece. We stabilized it with embedded wire and strong glue to keep the original wood. The metal was sand blasted and repainted. 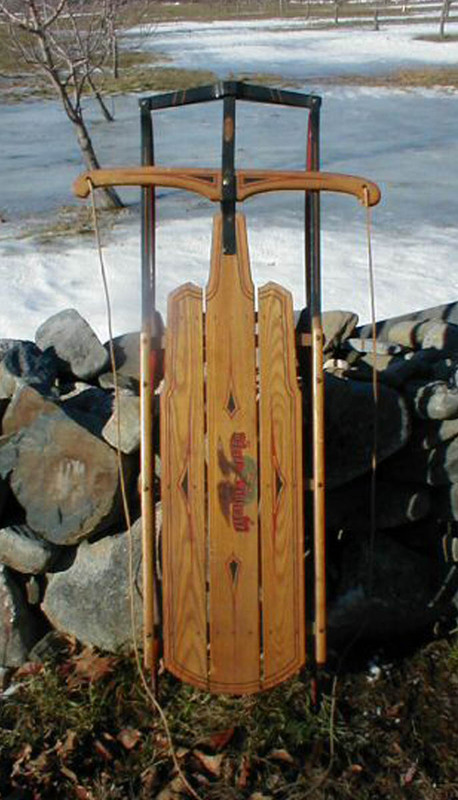 It demonstrates that an old sled can brought back to beauty if the underlying wood is sound. FF - 4 B This is an excellent specimen of an early Flexible Flyer with a wooden bumper. Note the wooden side rails running the full length of the sled. It has grooved runners and, with the black and red stripes, the date is estimated at from 1908 to 1914. We are fortunate to have obtained it as there are no defects at all. The footrests came with it. Does the $5.00 on the bottom indicate the original price? Early catalogs only had it priced at $4.50. FF - 2 C This sled dates after 1920 as can be seen by the cloud in the logo. 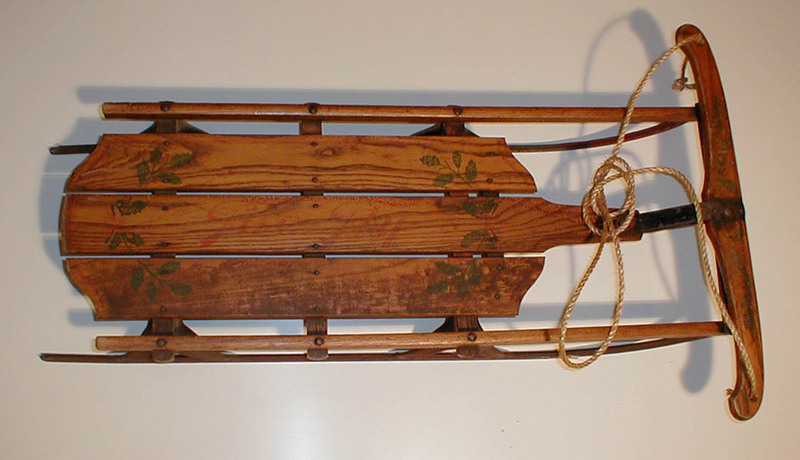 The scroll work is in great shape and the sled is in original condition. The second picture shows the metal forepart of the side rails. That innovation was initiated on the Flexible Flyers in 1915, except for the Tuxedo Racer, on which it was applied at an earlier date. FF - 3 C This sled also dates after 1920. 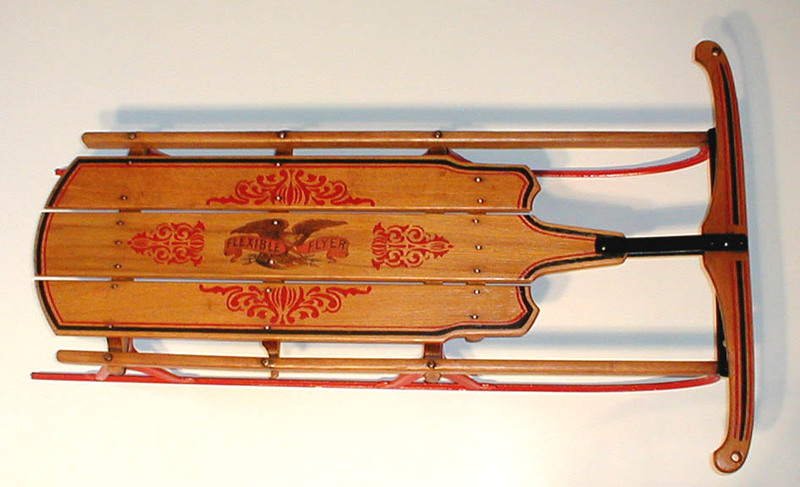 The scroll work is slightly different and the sled is in original condition. FF - 4 C These sleds date from 1915 to 1920. When acquired, very little could be seen of the graphics and the wood was bare. 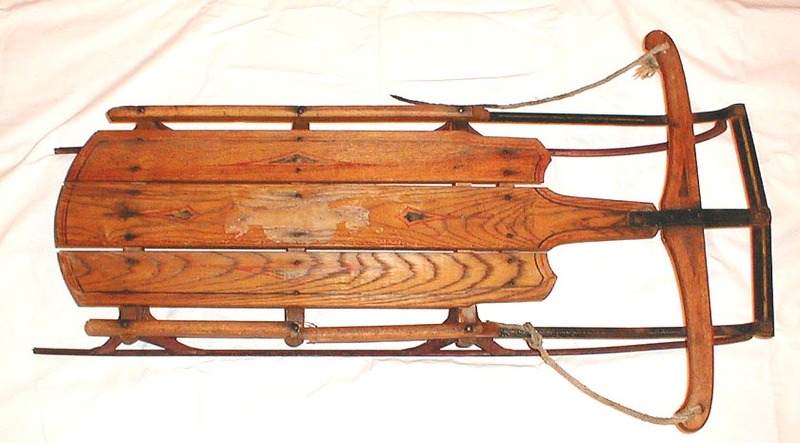 The upper sled had a broken side rail that was repaired, but otherwise both sleds were of solid structure. 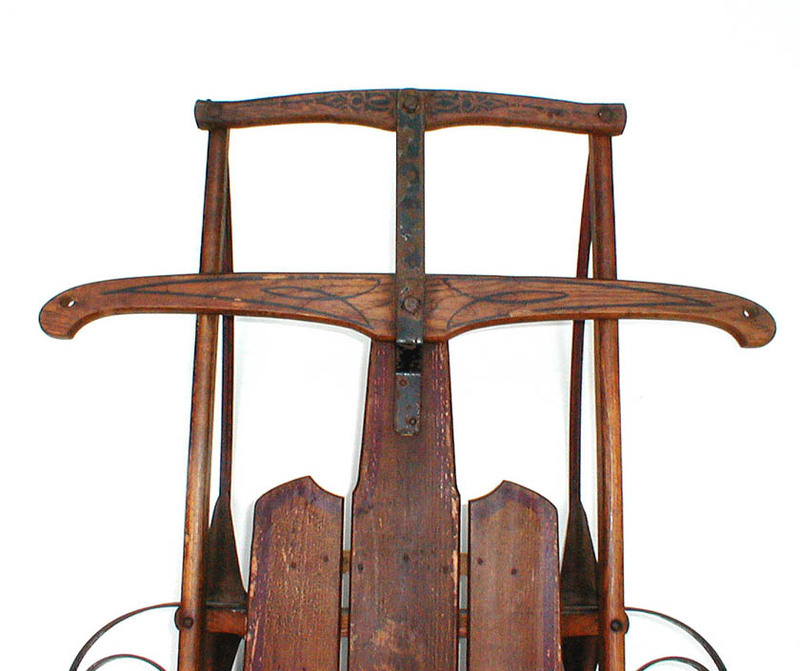 The sleds are pictured with close ups of their scroll work. The refinishing process is described in another section of this site. Both sleds had a pair of predrilled holes in the front cross pieces, and an extra vertical rivet with a nearby predrilled hole in the side rail. We learned that they were for foot rests that were an option when one purchased the sled. A local blacksmith accommodated us and built several pairs based on models from other sleds. All of the holes on the Nos 4, 5, 6, Chief, and Cruiser are the same, except for the second position on the No 5 and the Cruiser. A pair has been installed on the bottom sled. 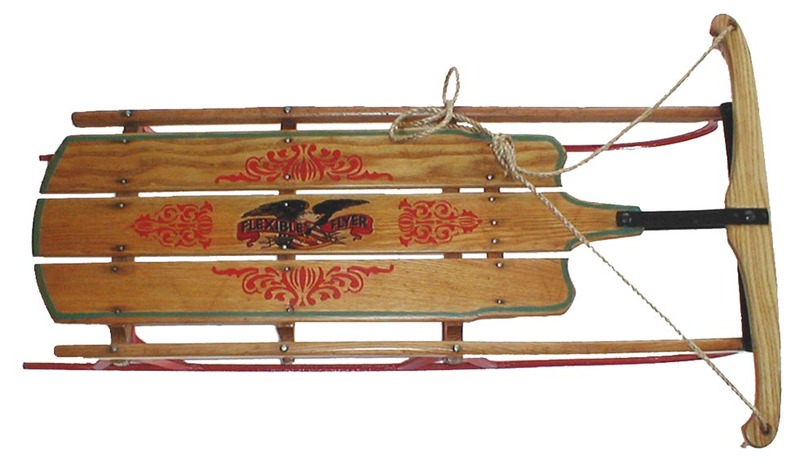 FF - 5 C This sled dates from 1921 as can be told by the fact that the eagle carries a sled. 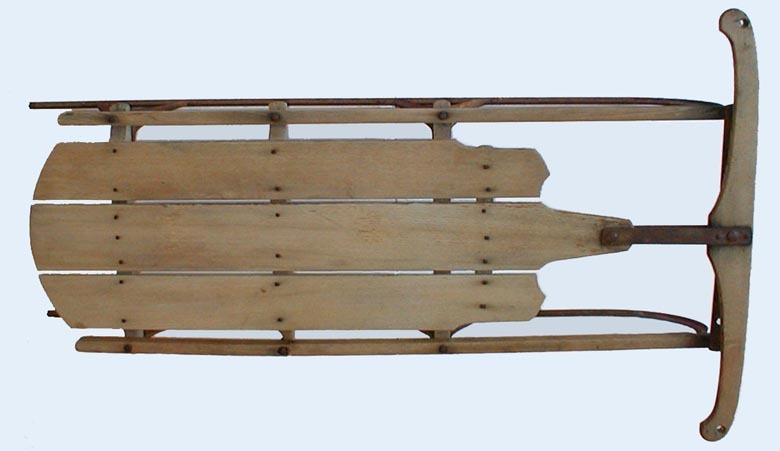 We call this the "Great Uncle Sled" and it well deserves the appellation "great" as it is 63 inches long. Note the stirrups or foot rests that came with it, for multiple riders sitting upright. The graphics in the middle of the sled turned out to be excellent after cleaning it with the methods taught by Art Bransky. The logo is about as good as it can be. FF - 5 C Another sled from the same era as above, but fully restored. The shellac finish had bubbled so badly that the graphics and lettering were hard to see. By cleaning the sled with alcohol, all of the bubbling (called alligatoring by some) was removed, but the logo and lettering remained. The side graphics were restored by hand painting and the center board graphics were restored first by hand painting the front one and then converting a digital image to a stencil with the help of a sign technician. The resulting stencil was used to paint the graphic behind the logo. After using a mild wood bleach, that did not touch the graphics, we used a satin finish UV polyurethane to produce a hard protective finish. A previous owner went to great trouble to strengthen the sled by adding screws to the top and pieces of reinforcing steel on the ends of the cross pieces. We left the screws but covered the tops with plastic wood that we stained. The metal was all sandblasted and refinished, and we added footrests to the positions. This sled is ready for use! FF - 5 C Yet another 5 C that needed restoration. Most of them do not have the foot rests so after a complete restoration (the center logo and side graphics were still ok) we attached both the front and second position foot rests, which are different. This sled will be used and not just displayed. 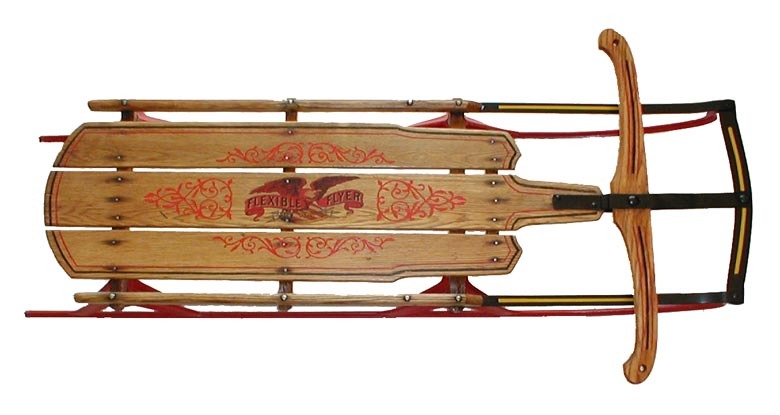 FF - 6 C This sled is 8 1/2 feet long and the longest made by Flexible Flyer. The estimated date is approximately 1915 because the Flexible Flyer writing on the bottom is very early. Note the 4 pairs of stirrups for multiple riders. The sled is structurally sound, but the graphics were missing, as shown at the right. We call it our Maxwell Sled - "good to the last ride" and are in the process of refinishing it. At this point, we are still waiting for a good reproduction of the scroll work for the deck. The rest of the sled is complete as shown below. FF - Fire Fly The Fire Fly has wooden rails to the bumper with a nice graphic of ivy and holly berries. 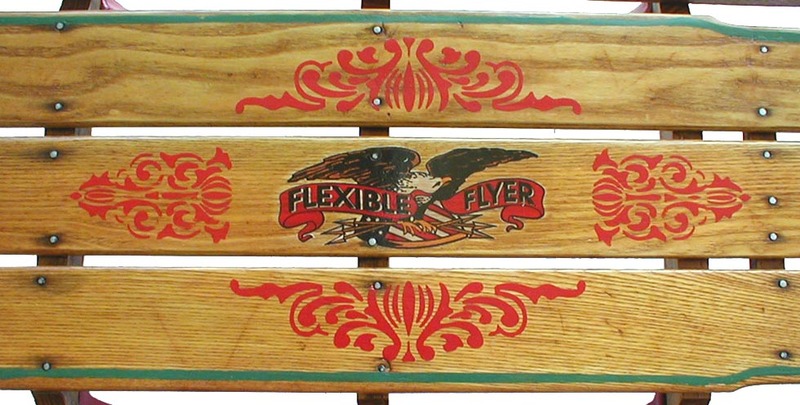 This was the economy line for Flexible Flyer and the wooden rails to the bumper were used later than seen on the other Flexible Flyer models. FF - 1E An early sled, probably from the late 1920's whose graphics were mostly obscured by age. 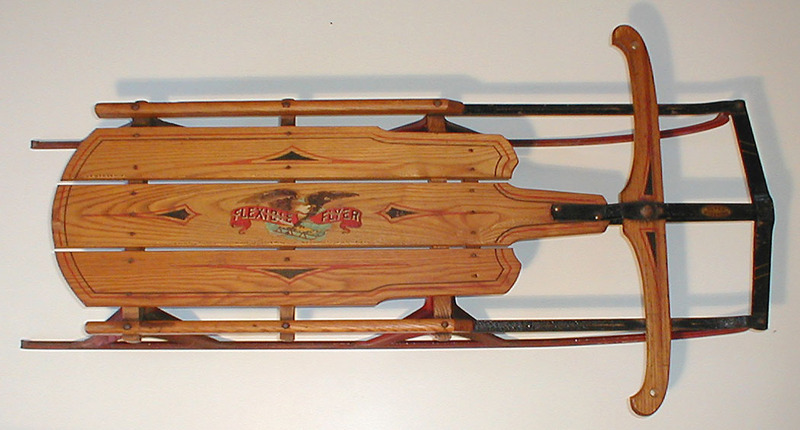 It has a single bar as a bumper, the same as on the C sleds as shown below. The picture at right is as it was received. Below right is after refinishing. There are no discernible differences between the rare E sled and the more common C sled. We would appreciate learning anything about this model. FF - 2F Probably from about 1930, this rare sled appears to be a forerunner of the G series with two pieces forming an articulated bumper, but no single piece over the top as in the G and later Airline Series. 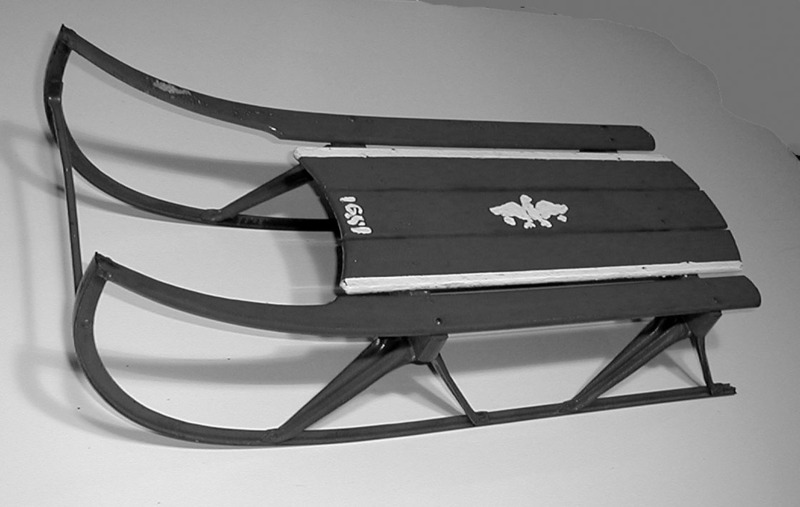 However, some F series sleds, as seen on a Junior Racer, did add the single bar as found on the G series. FF - 1G A refinished sled whose structure was excellent, but was virtually bare wood with rusted runners. The condition was worse than the 1E above. Note the single bumper covering the articulated two pieces as found on the F sleds. This arrangement, with slightly different shapes and graphics, remained the front end of all Flexible Flyers from then on, and was called super steering. 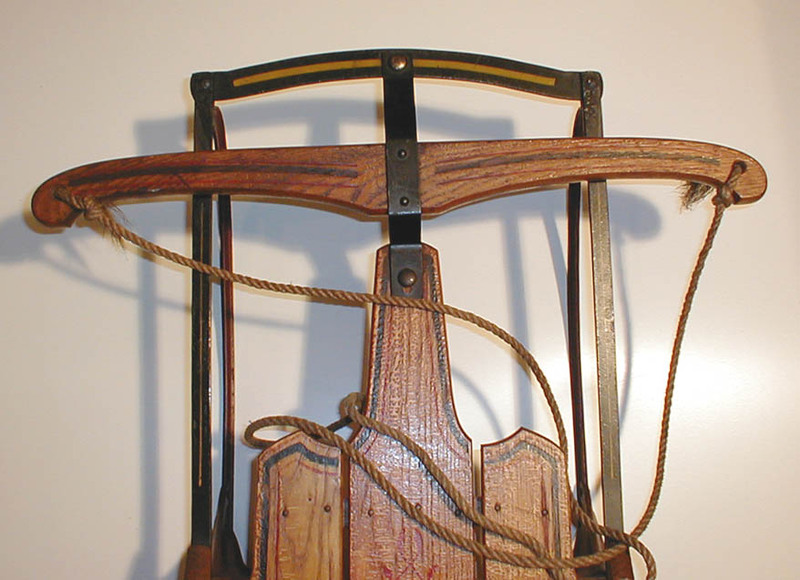 This steering was copied in one form or another by most sled companies in the future. FF - 1G Another 1G in original condition with the diamond back graphics. It differs from the previous 1G in that the bumper graphics consist of double lines at an angle to the bumper, the same as appear on the Airline models. 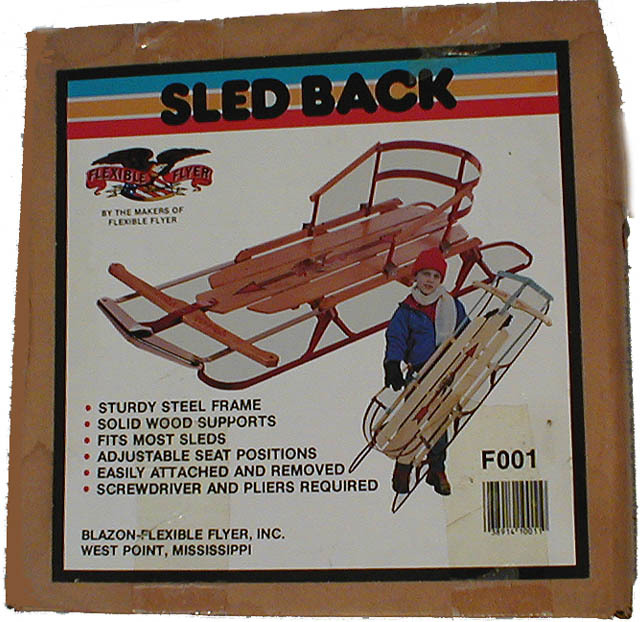 Perhaps this sled was continued at the same time as the Airline series for awhile. We mounted a Flexible Flyer sled back for a child. The backs were sold over a number of years. FF - 2G Original condition, 43 inches long. The G series also introduced the "Safety-Runners" where the end of the runners were turned back to prevent "cut legs and torn clothes." FF - 3G Original condition with diagonal stripes on the bumper that indicate it was made near the end of the straight runner sleds. The bumper at right is the same as on the Airline Junior, Series A, shown below. FF - 4G Outstanding original condition, this recent acquisition has the diagonal stripes on the bumper indicating that it was produced at about the same time as the Airline series started. 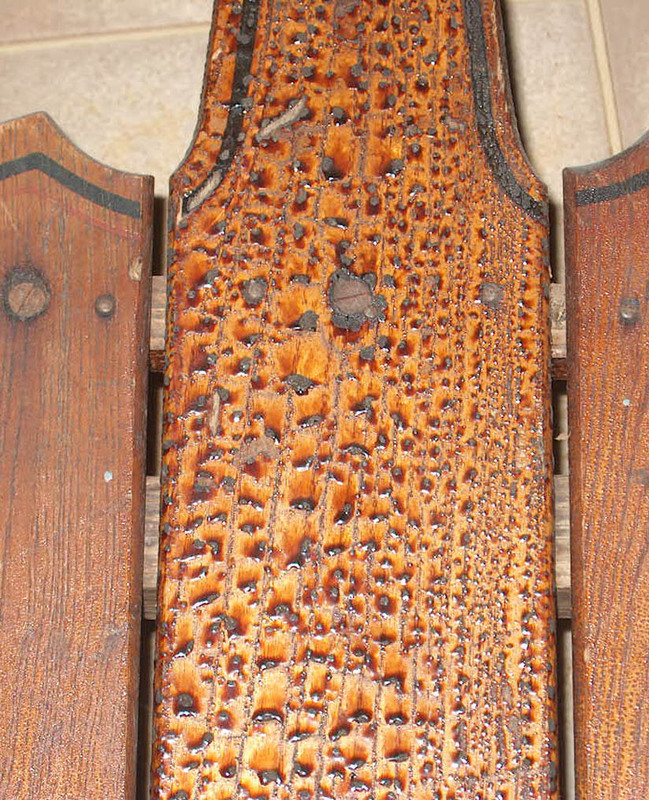 It has holes drilled for installation of stirrups or foot rests, which have now been installed, but not shown.